Perfect for delegates (20min walk from the Palais des Festivals, 5min in bus) and for tourists (3 min walk from the beach). 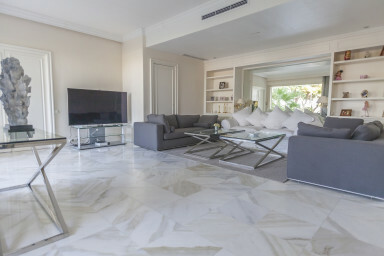 Located in a very nice residence with security on the Croisette. This 180m² apartment, south exposure, at the ground floor, has free WiFi and air conditionning. Maximum capacity : 6 persons. 3 suit bedrooms, 2 showers and 1 bath tube. 2 king size beds and 1 queen size bed. 1 big living room equipped with 3 comfy sofas and a living room for 8 persons. Enjoy a cocktail at the sunset on the south-exposed terrace. During this winter there will be some works on the building so it could have some noise.